In his 'heroes' day' speech Velupillai Prabhakaran (VP) chose to term his enemies as the Singhala nation. Through out his speech he attacks the 'Singhala nation' irrespective of the fact that Singhala nation includes friends of Tamils, relatives of Tamils, spouses of Tamils, saviors of Tamils, teachers of Tamils, good neighbours of Tamils and so on. In one red stroke he encircles all Singhalese into one circle and fires his bullets at them. Hitler sent millions of Jews into gas-chambers irrespective of their personal details because of his racial hatred. Would Prbhakaran be any different given the slightest chance to annihilate the Sinhalese nation "Personal racism is manifested through the individual expressions, attitudes and/or behaviours that accept the assumptions of a racist value system". LTTE value system is inherently racist in that they want to create a mono ethnic state solely for Tamils. In order to achieve this VP led LTTE have massacred thousands of innocent villages of both Singhalese and Muslims communities to instil fear in others' minds for them to leave their habitat. The speech that is full of racially motivated genocidal tendencies is a glowing testimonial of VP's racial hatred. "Sadly, the Sinhala nation is moving in exactly the opposite direction, on a path of destruction. It is trying to destroy the Tamil nation and, in the process, it is destroying itself. This beautiful island continues to soak in blood". Look who is talking! In the recent history of Sri Lanka, it has not seen any person who is blood thirsty, ego centric, power hungry, unsympathetic, inhuman and brutal than Prbhakaran. His language has always been full of threats of murder, mayhem and blood shed. Such a person once cornered and responded in the language he understands tries to blame the blood bath on others. "We are not terrorists, committing blind acts of violence impelled by racist or religious fanaticism". Contrary to this claim all his actions have emanated from racial and religious fanaticism. He and his killers have massacred hundreds of people in the most venerated religious places of both Buddhist and Islam faiths. Some examples are the massacres at Sri Maha Bodhi, Arnthalawa, Dalada Maligawa and Jumma Mosque , yet he blames the Singhala nation for not showing Buddhist love to him. "Although 80 million Tamils live all around the globe, the Tamils do not have a country of their own". The world may not fail to understand this time the true motive of LTTE terrorism. It is not just a physical need of a homeland within tiny Sri Lanka but a psychological need of a Tamil country sans all other ethnic groups or at least a country in which Tamils are the vast majority. The world should understand that the Singhalese cannot be held responsible for Tamils not having a country of their own. The Singhalese should not be allowed to be victimised just because it is a tiny nation that can be overrun with the help of 80 million Tamils all over the world. Over 65 million Tamils live in Tamilnadu the traditional homeland of the Tamils from where they migrated to all parts of the world including Sri Lanka. If they want a separate country for the Tamils the ideal place for them is Tamilnadu. The Irony is that the Tamils of Tamilnadu are more than willing to live in peaceful united India. The Scottish population defeated the referendum to separate Scotland from the United Kingdom because they knew that as part of the United Kingdom they receive more recognition and resources. Tamils of Tanmilnadu are more intelligent than Prabahkaran not to be misled by a mono ethnic country concept in a modern world. Looking from a different perspective what matters to LTTE is not that Tamils do not have a country of their. But most of the supporters of LTTE do not consider the countries they live in as their own because those countries have other communities other than Tamils. In other words they cannot cohabit with other people. Multiculturalism, pluralism etc are a no go zones in VP's racist ideology. VP's call for 80 million Tamils to rise and support the creation of a Tamil Country does not mean a Tamil country within the tiny 8000 Square kilometres of Northern and Eastern provinces of Sri Lanka that LTTE hold to accommodate 80 million Tamils but a much larger space to be annexed later. 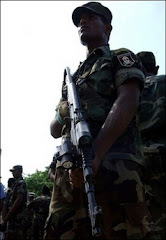 India should be warned about the mono ethnic state concept of Prabhakaran. Prbahkaran personifies racism!! !